Last week, Boston and I had the wonderful opportunity to visit beautiful Strasburg. It was such a suprising and amazing time. For a couple reasons... Mainly because my mom showed up unexpectedly on Tuesday. Well, I wanted her to come-to help me with Boston and to enjoy something new with him and I...but the week before cancelled the flight cause she didn't think she could make it. Then she showed up at my door! SURPRISE!!! But secondly... I had no idea how fun Lancaster, Strasburg & Dutch Country really was! I've been there to shop at the Outlets-but never for entertainment fun. Thank goodness my mom came though. Cause I was running nuts in the first place and taking care of a 2 year old on top of that? Ugh. Yeah. First off-I have to give you this huge tip. If you are heading to Strasburg and have plans to where you have to be there at a certain time... LEAVE early! And I mean REALLY leave early!!! We left at 7am for a 10:30 train ride. That's 3 1/2 hours. And we were LATE! Strasburg is only 60 miles from my house. Yep. You did the math right-WE. DID. NOT. MOVE. FOR. AN. INCH. ON. 202. Gulp. So... either don't take 202 from the city (Philly) or find another route, k? When we finally arrived-Boston was in TOTAL train heaven! And the Strasburg Railroad was JUST the beginning! I found the ticket to be quite funny! 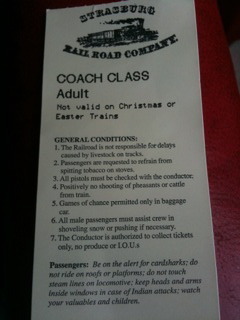 There are rules on the ticket-that if you look closely you can see! Also during the ride-I found it cool that you can flip the fuzzy blue seats around. When they get to Paradise, Pa - the front of the train unlatches and moves around to the back of the train..where there to take us back to the station. You can hop on the train and stop along the way to enjoy a tasty packed lunch (or one you get from the cafe on site). Or....you can get off and enjoy Cherry Crest Farm. On the train ride-you get to see bits and pieces of Cherry Crest Adventure Farm. And that my darlings...is my next travel episode of our Whirlwind Trip to Lancaster. Here's a video of our Strasburg Railroad visit.